SUSAN ELIA MACNEAL: Here in Park Slope, Brooklyn, we have some, er—interesting—graffiti. 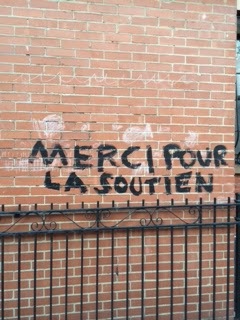 This one, MERCI POR LA SOUTIEN (which translates to "thank you for your support"), is close to us. It makes me smile every time I pass it. This is my one-year anniversary of blogging with the Jungle Reds and I am so, so, so grateful and thankful for your support. First of all, thanks to the wonderful Reds (who've gracefully responded to my wacky and sometimes a bit crazy emails over the past year). And also, thank you to all the readers, who have embraced me and made me feel at home and part of the Reds family. It was, in truth, a hard year, but this blog has been a constant source of joy and fun and learning. And I look forward to more bloggy fun in 2015! And so — to all of you guys — thank you for your support! P.S. This graffiti was written well before the horrible evens that have happened in France in the past week. It always amazes me how fast the year seems to go. I have enjoyed your blog posts [and your books] and am looking forward to more in the coming year . . . . Thank you, Joan and Reine! I've enjoyed getting to know both of you, too! Oh, gosh, you've been a Jungle Red FOREVER! You just started on the blog a year ago. (Really, though? It seems like it's been yeeeeears...) (You'd think it'd know you're not a robot by now. Susan, you've been a great addition to the blog with your interesting posts about so many different topics. You always have something to say that I want to read. The three areas that I'd like to especially send out the kudos for are 1) keeping me apprised of your writing, so that I now have purchased your series and have it prioritized as my first reading series of the New Year 2) Miss Edna and your relationship with her where you both gave so much to each other 3) Your connection to your son's reading which culminated in the Harry Potter room, possible gaining you and your husband the Coolest Parents of 2014 honors. Congratulations on your one year anniversary and thanks for enriching my days by your presence here. I'm getting to this late in the day, Susan, but it's a ray of sunshine in a gloomy winter day (snow on the way I think). Personally I feel so delighted that you agreed to join our particular fold. Or crease. We're lucky to have you. Susan, so glad you're a Red. I enjoy hearing about your writing, your family, and friends. And you've brought some interesting people on the blog. Thanks! Susan, it's been lovely having you on Jungle Reds, Have so enjoyed getting to know you through your posts and comments on here. Congratulations on your anniversary--and here's to many more to come! Susan, we're so glad you're with us, and that we've been there with you this last year!